So, on a post-pub whim, I bought a KB Covers Logic Keyboard Cover, which arrived a couple of days ago. 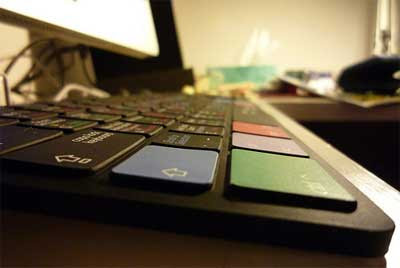 It's a printed, embossed latex sheet which slips over the thin aluminium keyboard and shows 130 colour-coded shortcuts. Good things: It works - the rubber sheet is pefectly moulded, fits very neatly, and comes off easily. Most keys are snug, although the space bar is a bit flappy. The printing is crisp and clear. Most importantly, it's a really useful way to learn Logic. I know that if a command merits a place on the overlay then it's probably useful. I immediately learnt how to zoom around the windows quickly, something I'd looked up in the manual a couple of times without any luck. Bad things: Yes, it makes your keyboard look and feel almost exactly like the 16k ZX Spectrum I had in 1982. $39 is not cheap (shipping to the UK was a reasonable $8), but this is a specialist product. I wonder if 70% of the value comes just from having a clear diagram of the most useful shortcuts (which happens to be stuck to your keyboard). I took a high res photo of the overlay with all the commands visible, but decided not to run it, because it felt mean to the company. Is that lame? UPDATE: The company don't mind, so here's the full sized image of KB Covers Logic overlay with all the commands visible. If they made a KB Cover for Cubase or Nuendo I'd buy it. Throw Live in there as well and I'd pick another one up. hmm- id be interested in seeing a closer look at the keyboard, or even part of it, if just to know that there are 39 bucks worth of shortcuts on it. @swish: there are at least $42 worth of shortcuts on it, making the $39 price somewhat of a bargain. in all seriousness, i bought this and it is immeasurably useful in remembering really useful keyboard commands. the command, shift, option, and control buttons are all color-coded and the commands that require those keys as modifiers are indicated on the appropriate keys in the same color. also, unlike the logickeyboard extended keyboard, it has the default commands instead of a special set, so you're actually learning the key commands you'll likely encounter in other logic-based studios. as an added bonus, keyboard covers in general prevent little bits of stuff from getting under the apparently non-removable keys of the aluminum keyboard. I'd be interested in a pic too, kind of bummed their site doesn't offer a better pic. I understand that the thought of people using the pic to learn shortcuts is a concern, but really - I'm NOT going to buy the thing without having a look at it. It does sound useful and like a nice idea though. Looks cool from afar. who sell super heavy duty sticker sets for major audio, video and graphics packages for a tenner which you add to your own keyboard. I run video and audio editing facilities at a university and have these on all the workstations - they really do help you to work faster and smarter. Surprisingly, they stay stuck down and keep their colour. I've recently set up a new Pro Tools based rig at home and just installed a set of stickers here. It's the first time I've had them on a computer that's used for day to day work as well, and interestingly I find it's harder typing normally on the keyboard with the stickers on: I think the colours are a bit distracting for writing at speed. Is this just me? Hi Tom, we've reviewed the same item on AudioNewsRoom in june, and basically we had the same positive impression. Man, I'd love to see a pro tools keyboard cover for anything like that cheap. "Bad things: Yes, it makes your keyboard look and feel almost exactly like the 16k ZX Spectrum I had in 1982." Surely that's a good thing...? For the ones who are using Live; they are going to release an Ableton Live version within a few weeks..
On my seventh or eighth day of KB Cover ownership, I had my first 'full-keyboard' spillage. A feeling of smugness washed over me like ____________ . Note that the default zoom keyboard shortcuts changed in version 8.0.2 to Command and the arrow keys. The old way (that's been with Logic forever...) was Control and the arrow keys, but this conflicts with Spaces in OS X. Got really excited about this...then realized that the MacBook Pro version isn't available for European keyboards which deflated me a bit. Hope one comes along soon.